So let’s start with a couple of basics…. 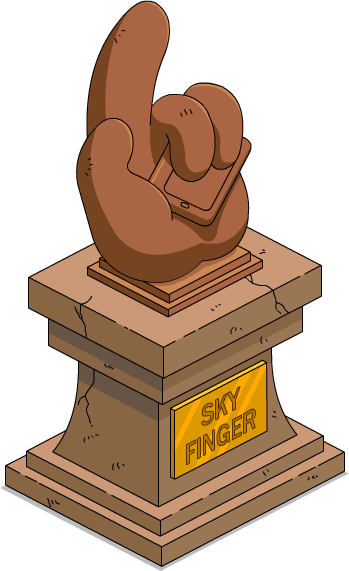 -As of right now, the Sky Finger monument is free and only available during this event. According to the files, the ability to unlock the Sky Finger Monument leaves on March 12th…with the mini-event. So if you don’t get it now I don’t know what will happen in the future. -From what I’m seeing it only clears building income (including Krustyland tickets), I do not believe it works on jobs. -You can only tap it once every 24hrs. Quimby: Order, order, I, er, bring this town hall meeting to order! Something strange has come over our town. And it’s not March Madness because we eradicated that years ago. We’ve been having a series of, well, I don’t want to say Biblical plagues but I’m, er, going to. Quimby: No one likes to hear about global warming. So let’s put our heads together and find something else to blame. Ned: Isn’t it obvious? We know exactly who to blame-diddly-ame. Lovejoy: Oh no. Dear Lord, why do I even bother leaving my trains? Ned: We have incurred God’s rather just wrath because none of you were willing to spend one hour in church one day a week. But you’d all rather sit around in front of the TV getting fat than visit our Lord on a Sunday. He’s seen how you’ve pushed him aside in favor of all your vices, and now he’s sent a plague to teach us. We must show him we got the message loud and clear by erecting a monument to him on the front steps of the courthouse! The Ten Commandments erected in solid gold ought to do nicely. Yessir, empty out your pockets and let’s start the collection. Blue Haired Lawyer: I feel I must advise you that erecting a statue to the Ten Commandments would violate separation of church and state. Quimby: Not to mention that gold is both tacky AND expensive. Ned: B-but, if we don’t erect a statue to our Lord then how can we expect his forgiveness?! Homer: Wait a minute, if we’re going around erecting statues to gods then what about Sky Finger? Lovejoy: Hmm. Sky Finger is not formally recognized by the church, more’s the pity, so it wouldn’t violate separation of church and state. Quimby: Great! A proposal that’s unlikely to get me sued. Make it so! Homer: Wait a minute! I thought we were making this statue out of solid gold?! Quimby: My heart said gold, but what’s left of the city budget after I, er, borrowed some funds, said styrofoam convincingly painted like bronze and stone. Homer: So Sky Finger erects an entire city and this is all the thanks we give?! We can do better…maybe? Quimby: Better? What more do you want, a parade? We’re not allowed to have those anymore after the last one ended in a stampede. Homer: What about a ribbon cutting? Quimby: That also ended in a stampede. We’re a town of stampeders. Homer: There must be something we can do to show our devotion to Sky Finger?! Like, I don’t know, a funny limerick or something? Ned: I think you mean a prayer. Quimby: I’ve never known a limerick to start a stampede. Let’s give it a go. Homer: A God amid thumbs is our Sky Finger. On the might of its point our lives linger. Our town isn’t the same. Since its knuckles took reign. Something, something, comedic rhyme, the end! Quimby: That was barely a limerick, but at least it didn’t result in a stampede. Marge: Homie gave it his best, that ought to be more than enough. Ned: Yes, everything always seems to work out for him, but in matters of religion I really think you ought to listen to a more Godly man. Homer: Hey! Sky Finger! I wrote you a poem; I’ve never even done that for Marge. Come on, I’ve always thought we were pals! Don’t turn your back, er, the back of your finger on us now! Homer: Woohoo! I knew Sky Finger was our one true savior. Ned: B-b-but! I’ve been praying to our Lord for a miracle for years and Homer recites half a poorly written limerick and gets it?! Lovejoy: Come along Ned, I’ve got a bottle of communion wine I’ve been saving for just such a crisis of faith. Homer: Bless you Sky Finger, I’ll worship at your altar as often as I feel like it, and always with a side of nachos. So once you’ve completed the questline, and gotten to the “Use Sky Finger Monument” task you’ll start the timer for Sky Finger to clear all buildings. Tap the monument and you’ll see the Sky Finger Monument details. If it’s ready to go you’ll see it say Ready! and have a Purple Start button to tap. Tap that button to automatically collect income from all buildings in Springfield. And that’s it. Really simple to use! Be sure to put it somewhere in your Springfield where you can quickly access it when you open your game, so you don’t have to go looking for it. How Do I Get It: During State of Despair mini-event you unlock it via the Get to the Point questline, which is triggered by Quimby. After the mini-event, we’re not sure if it will be available to unlock and/or how it will be unlocked. And that’s it my friends, the Sky Finger details! Are you excited to finally have the collect all feature in Springfield? Where will you place the monument? Sound off below, you know we love hearing from you! This entry was posted in Addicts How-To, State of Despair, Tips and Tricks and tagged collect all in springfield, does the sky finger monument clear character tasks, Get to the Point questline, how big is the sky finger monument, how do i clear all buildings at once in springfield, how do i get the sky finger monument, making tsto better, sky finger monument, state of despair mini event, Tapped Out Tips and Tricks, The Simpsons Tapped Out, TSTO Addicts, TSTO Events, tsto feature updates, TSTO Tips and Tricks, What does the sky finger monument do. Bookmark the permalink. I found since I placed the finger statue my golden goose land tokens would be reset to 12 hrs but no land token in my inventory. After 4 days w no land tokens I stored the finger statue and was able to get my first land token in days the next morning. I’m happy they introduced this but have the same issue everyone else has which is by the time you clear all your character jobs, 95% of income from houses/property is collected anyway. They need a second “finger” to collect all character jobs in one go, that would be amazing. INTERESTING SIDE NOTE: If you do as others are doing and going back into your Springfield after re-syncing to collect money from buildings, the donut factory resets too so I am literally farming six donuts every 30 seconds or so by re-syncing the game. Get them while they’re hot. That happened with my donut factory also, but when I went back into my game it had subtracted those donuts. Are donuts actually staying in your total after going out of the game and then coming back in? Yeah, I thought so until I tested it a bit. They get reset back every time. I suspect the same bug that people are seeing with land tiles. So basically on every re-sync buildings get their currency reset (whether that be money, donuts or land tiles etc). Money can be collected each time, land tiles and donuts can’t. I don’t know what happens long-term now because if I go in 2-3-4 times a day to collect event currency it’s going to reset the donut factory and land tile generation? Of course, with money comes XP so the more building money/XP collected, the sooner get donuts generated but I think overall it is affecting donuts from the factory? I lost the getting of my land tokens from GGR too. I am only at level 106 and still cash poor. This glitch is really hurting my progress with growing my city. That is why I spent the donuts to get GGR. How many tokens do you have built up? I have noticed that it does not work on chippy, the Spuckler kids, or the Krustyland vistors. I have noticed that I have to click on them myself in order to get the cash, and xp or Krustyland tickets. Getting lots of glitches with my Sky Finger. I have 4250 white houses. I used to collect a few rows then visit friends’ towns to clear up the mess and get a level up when I return. Now it just clears everything if I check in with without tapping ALL of it. Hopefully EA will fix this. Not sure if anyone is having this. But I noticed the last couple(3) days that sky finger animation goes and clears all the buildings but it doesn’t collect anything. Anyone else having this issue? I’m having an opposite and very helpful problem with my game. I assumed it was a glitch from the finger. Anyone else having very generous houses/buildings? Yes. A number of (but not all) my buildings are ready to collect every time I log in, even if it’s only been a few minutes. They’re also ready when I come back from visiting my neighbors. Yeah, count me in (not that I’m complaining). On Thursday, I spent a lot of time collecting money and Golden Goose land tiles every time I synced the game. By keeping my phone plugged into the charger, I “earned” (during my spare time throughout the day) every piece of land in the game (and I had a long way to go). I also gained approximately $120,000,000 too. While I left a couple of tiles free, I (unfortunately) purchased the mysterious corner pieces. Consequently, I never had the opportunity to cash in extra land tiles for donuts. Otherwise, I would have made a windfall in donuts! Now, I am only able to collect the money from the Golden Goose. Bummer for me (and I wish that I had read the update). I suspect that this might be related to the Sky Finger monument. I have the opportunity to get it, but I haven’t yet. So, every time I sync the game, many of my buildings are ready to collect — including a majority of my 12 and 24 hour rent collections! I will get my “free” Sky Finger Monument before the event ends. However, I am in no hurry. I’m happy collecting money (and I am using it for massive numbers of KEM for donut farming). Noticed it doesn’t collect Krustyland tickets from people either. I had noticed that collection times and a few other things were off and wondered about it. Reading comments here it looks like it’s this monument. Hopefully EA gets it fixed. Has anyone tried storing the finger to see if it returned the buildings back to normal collection times? I’d gladly do that if it meant my game working correctly again. I’ve tried that as loads of my buildings just have their timers reset when I login (esp my house farm) so I can’t collect any income from them. I stored the statue, waited half a day before logging in but the problem still persisted. Pulled the statue out of storage only to find that its own timer hadn’t reset but was at around 10hrs to go. I seem to be having the same issue. I stored the monument, but when I start the game, the times are reset on building that I would have been able to collect from. It’s bad enough I’m losing all the XP for the donuts, but I’m not collecting my free land token every 12h from the premium building I bought just for the land token. Very disappointing!